St Loman’s hosted Athlone in Lakepoint Park last Friday night in an enthralling encounter which resulted in the Blues holding their unbeaten League record intact. After previous wins against Shamrocks and Tyrrellspass coupled with draws against Coralstown Kinnegad and Rosemount, The Blues were seeking eight points from five games. On a cold April Night in Lakepoint Park, there was very little between the teams but it was a touch of class right at the death which separated the two sides. The first score of the evening came from an unlikely source in corner-back Tristan Graham who slotted over after a surge forward from David Whelan. The Visitors got off the mark with two placed balls, one a long-range 45 and the other a routine free both from Kieran Colclough. The Returning Ronan O’Toole making his first appearance of the season for Loman’s, equalized with an excellent point following some of his trademark quick footwork. Athlone took advantage of a strong wind reeling off an excellent score to keep their noses in front. Paddy Dowdall brought the Hosts level with a terrific point, before an O’Toole free put the Blues ahead. Both teams then traded two scores each with Ronan O’Toole and Paul Whelehan on target for the Saints. The Visitors finished the half stronger and reeled off 1.03 without reply. Although there was a strong breeze blowing in Lakepoint Park, the quality of these scores should not be understated with Athlone scoring three wonderful long-range points from play before finding the net moments later. The goal came after a super one-on-one reflex save from Loman’s Goalkeeper Stephen Gallagher but the Visitors found the net at the second attempt a few seconds later. Athlone lead by 1.08 to 0.06 at the interval and despite the conditions the Blues were up against it at the break. Whatever Manager Luke Dempsey said to his players at Half-Time seemed to work, as Loman’s were out of the traps quickest in the Second Half. Ronan O’Toole got the scoring underway with a delightful score off his least-favoured right boot. Youngster Sam McCartan floated over a point before another O’Toole free reduced the arrears to two points. Athlone went a further point head with a yet another placed ball from Colclough. In their debut season for St Loman’s, Paul Whelehan and Midfielder Stephen Gallagher combined with the former forcing a turnover high up the pitch and Gallagher pointing to leave two between the sides. Sean Flanagan pointed from distance after TJ Cox won a kick-out, with only a single point now separating the sides. On a night where we saw some excellent scores, the Visitors scored the pick of the bunch from yet another placed ball. Athlone’s Centre half-forward, Colclough converting from an outrageous position against a formidable wind. The Hosts responded swiftly with O’Toole registering his sixth point of the night. The Blues introduced David Winsdor and what a substitution it turned out to be. Winsdor drew the Saints level with a beautifully taken score and he went one better moments later putting Loman’s ahead for the first time in the second half from almost the exact position as before. However, The Shannonsiders didn’t go away and levelled with a well-taken score from play. The teams were level going into Injury-time, but a moment of magic would prove the difference. Athlone seemed to be in a promising position but Kelvin Reilly forced a vital turn-over with some tenacious tackling. 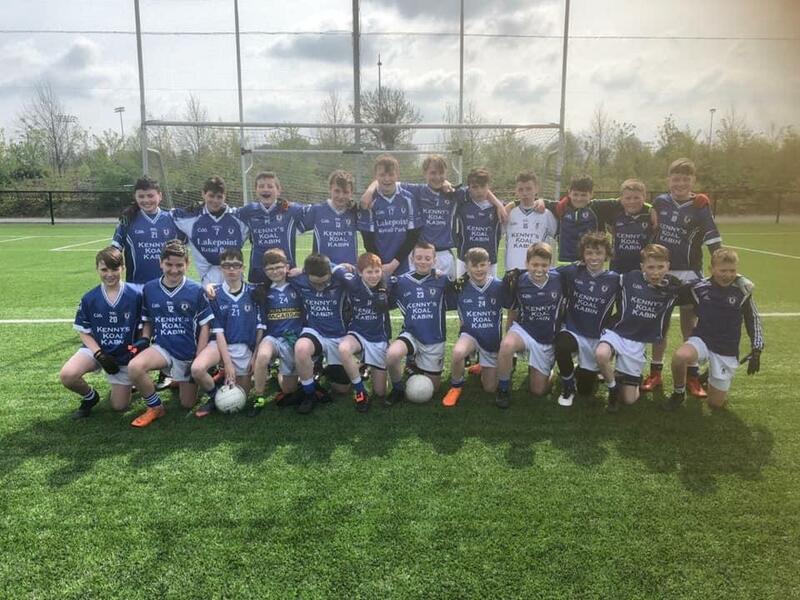 From the resulting turnover St Loman’s broke clear, with Sam McCartan becoming the hero with a fantastic point from the just inside the 45-metre line, a score which was fit to win any game of football. Indeed it was this point that gave the Hosts a hard-fought victory by a single point. On the Night there were fantastic individual performaces, at the back Paddy Dowdall held the fort superbly especially in the Second Half. Up front Sam McCartan continued to impress with another mature performance, meanwhile David Windsor showed his experience and changed the game from the substitute’s bench with two vital points at a crucial stage. Man of the Match however was the returning Ronan O’Toole. After recent success with the County, Ronan reproduced his form with his club with six points on the night and some excellent link up play. The Blues continue their unbeaten start after a dramatic late finish in Lakepoint Park. Team; Stephen Gallagher, Sean Kelly, Sean Flanagan (0.01), Tristan Graham (0.01), Sean Lancaster, Paddy Dowdall (0.01), David Whelan, Kelvin Reilly, Stephen Gallagher (0.01), Sam McCartan (0.02), Ronan O’Toole (0.06), Chris Gilbert, TJ Cox, Paul Whelehan (0.01), Conan O’Hara. Subs used; Conor O’Donoghue, David Windsor (0.02), Paddy Lynam, Stephen Ryan. It was not to be our day today in Abbotstown with Burren Rangers, Carlow running out worthy winners of the Leinster League under 13 Division 2 Shield final. Thanks to all the boys, coaches and parents. The boys did themselves and the club proud reaching a Leinster final - there will be lots more finals for this bunch of lads over the coming years. St Loman’s would like to offer its condolences to the Smyth and Keane families following the passing of Catherine Smyth, Ardmore Road, Mullingar, Co Westmeath and formerly of Mannin, Clostoken, Loughrea, Co Galway. We would also like to offer our condolences to the Rooney and Freeman families following the passing of Maureen Rooney, Ballymore, Co Westmeath.